3. How do I open an Etsy shop? Etsy is an e-commerce platform which allows a user to open his own shop and sell his goods. It is not really like Amazon or eBay because Etsy shops focus more on selling only handmade items or vintage. It was launched in 2003 and it is still growing rapidly every year getting more and more sellers and buyers. 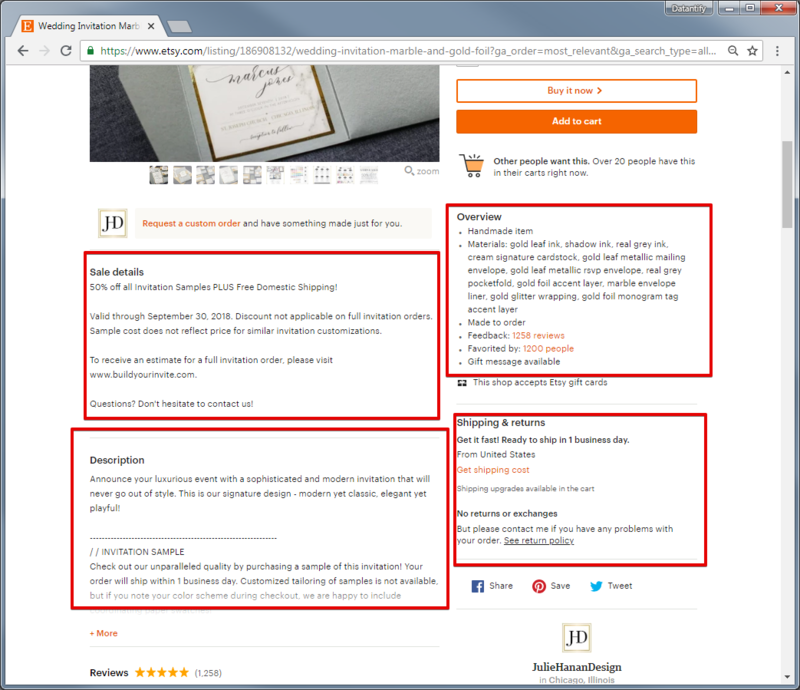 That’s why we have prepared below the guide how to open new Etsy shop to help you start selling easily and effectively on this platform. 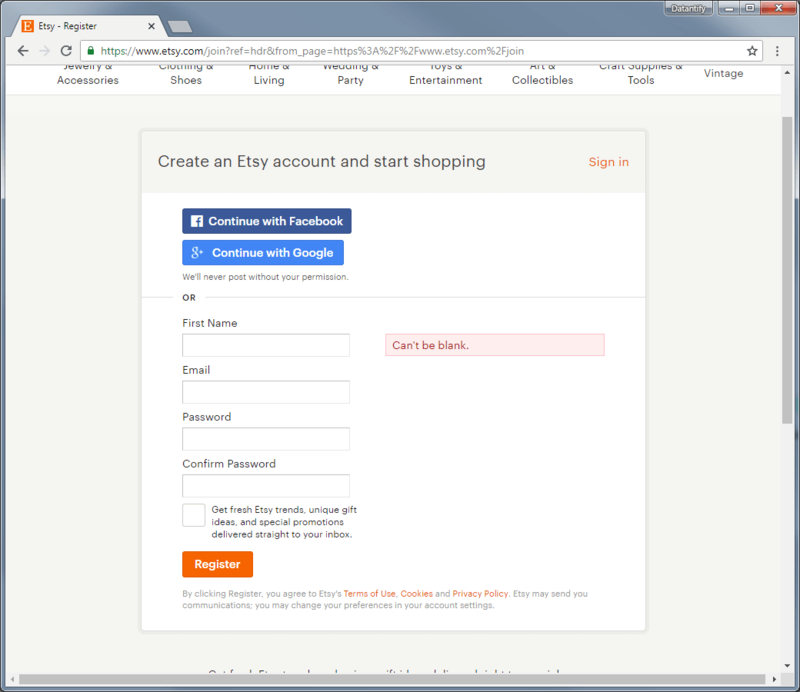 To open a new Etsy shop at first you need to create an account. As with the majority of websites, it is pretty simple and easy, but we will describe it for you anyway. Click the register button in the top-right corner and insert your e-mail address which will be used to log in later. Registering in this way is mainly for buying because if you want to open your own Etsy shop you need to fill a little bit more required information about what you can read in the later part of the guide. 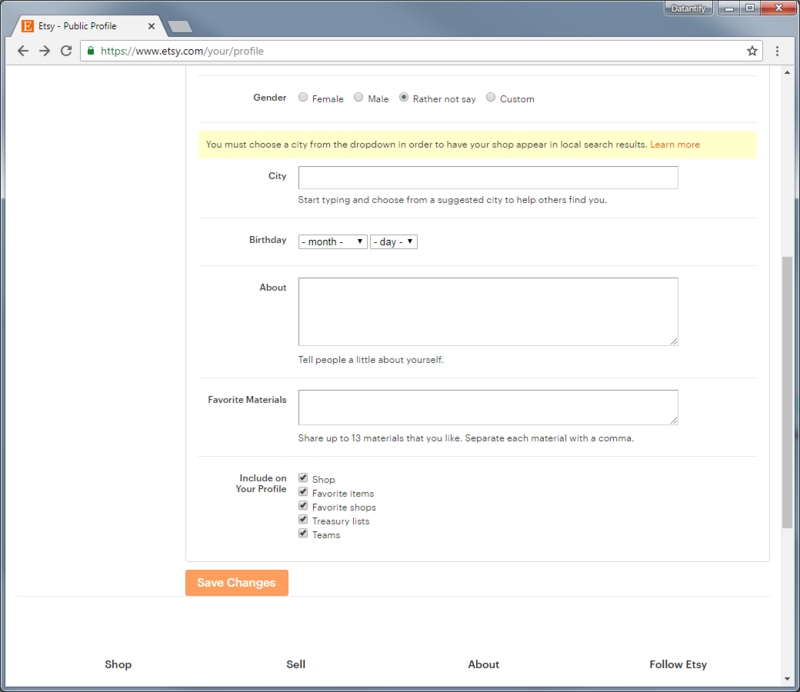 You can already see “my Etsy account” when you click on your profile logo where you can edit a lot of personal data so others can see what are your favorite materials and mainly who you are. Opening new Etsy Shop is pretty easy you just need to follow a few steps. 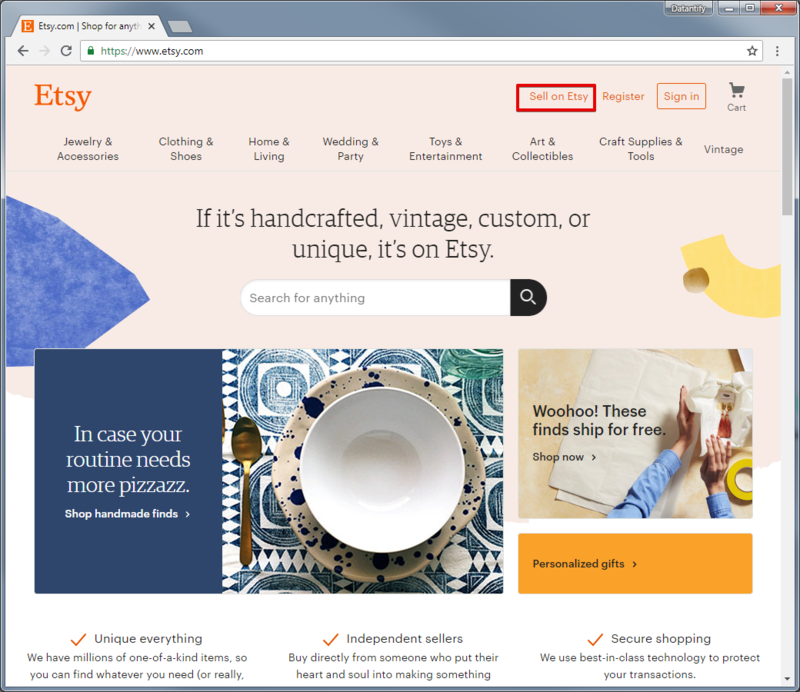 At first, you should notice the “Sell on Etsy” button on the website menu. 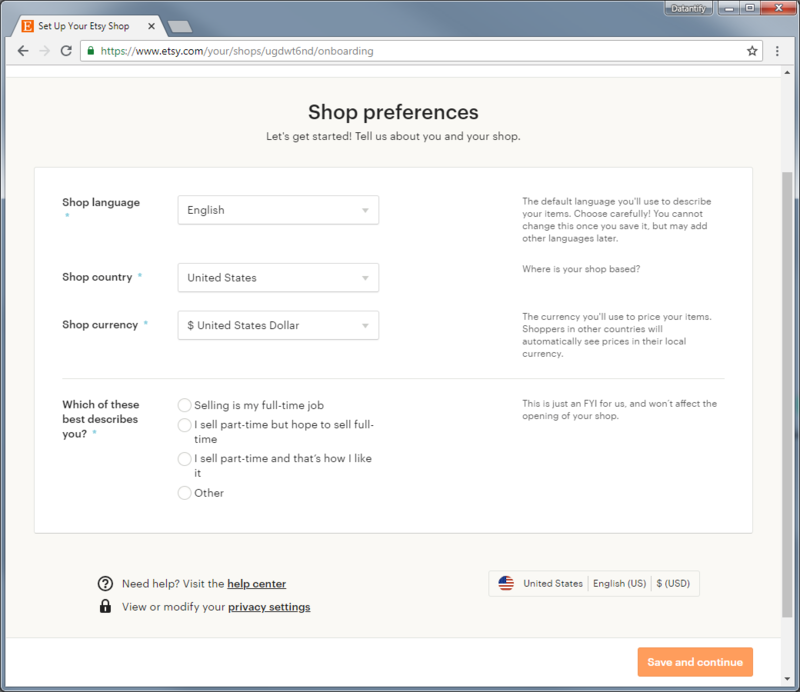 In the beginning, you need to set your shop preferences like the language, shop country and the currency which you want to receive. 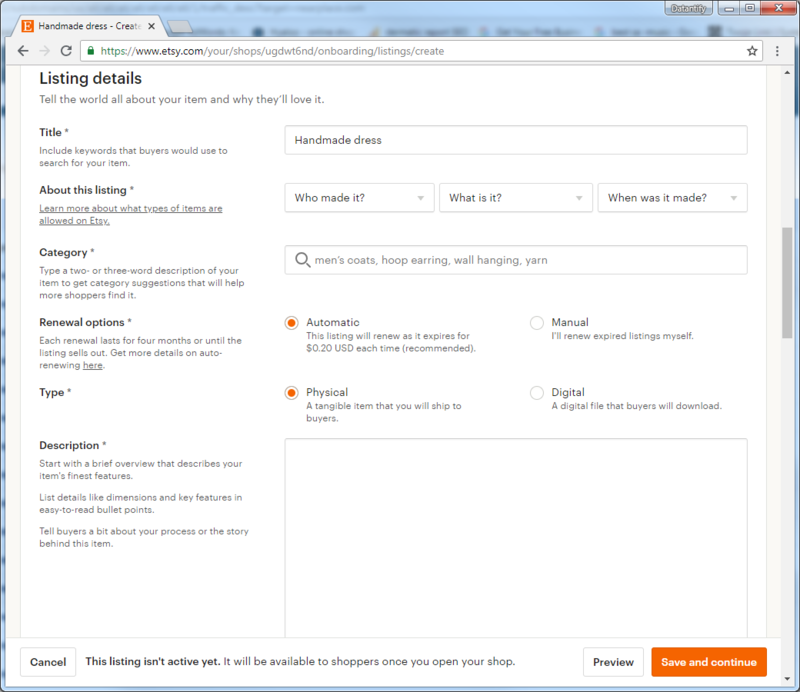 Etsy also asks if selling handmade items is your full-time job or not. It will not affect your shop, they are just curious. Next thing required to do is to name your own shop. It will appear next to each of your listings so think about it seriously. A good name might bring in more customers. 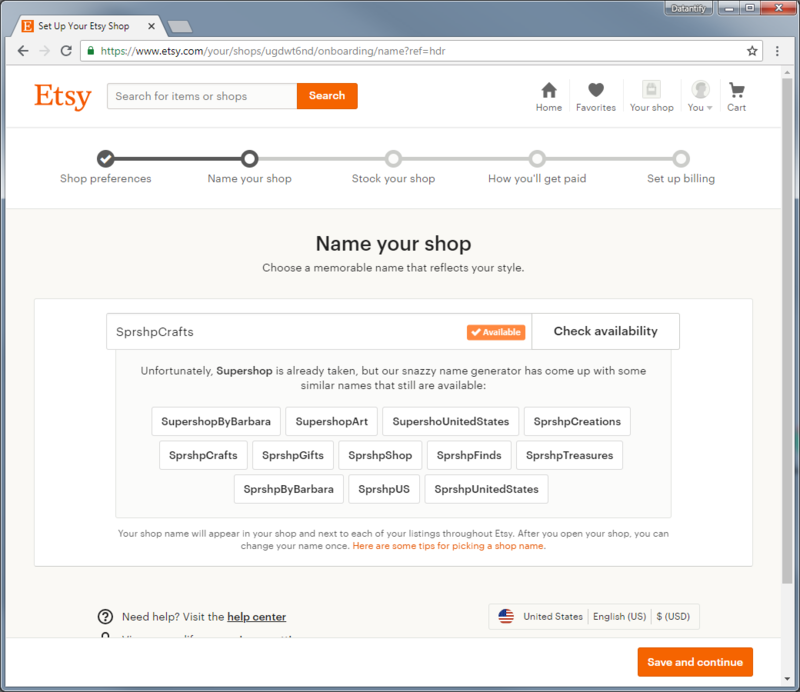 Etsy understands that sellers might make a mistake or not be satisfied with the name and that’s why they allow users to rename their shop once. Always try to show the usage of item e.g photo when you are wearing your own handmade clothes. Try to adjust the scale of your object so people can see what sizes it has e.g compared to the table. Once you set up your goods photos now it’s time to enter some details. At first, you need to create a catchy title which might bring you, customers. You should use popular keywords that buyers often enter into the search filters then even if you have a new Etsy shop there is a chance someone will notice you really fast. You need to specify if the item was made by you, a member of your shop or by the other company. If the item is not made on your own you need to mention in the Etsy shop the person or the company which has created this item for you. Also, you need to select a user of your item – if it is a finished product or a supply or tool to made things. It is really important because some people want to buy not only the completed item but to make something on their own. The last thing to select in this tab is a date of the production. So people can see if the item was made recently and it is more likely a new product or if it is some kind of a vintage. Enter a few words and Etsy will suggest you the most relative categories to it. 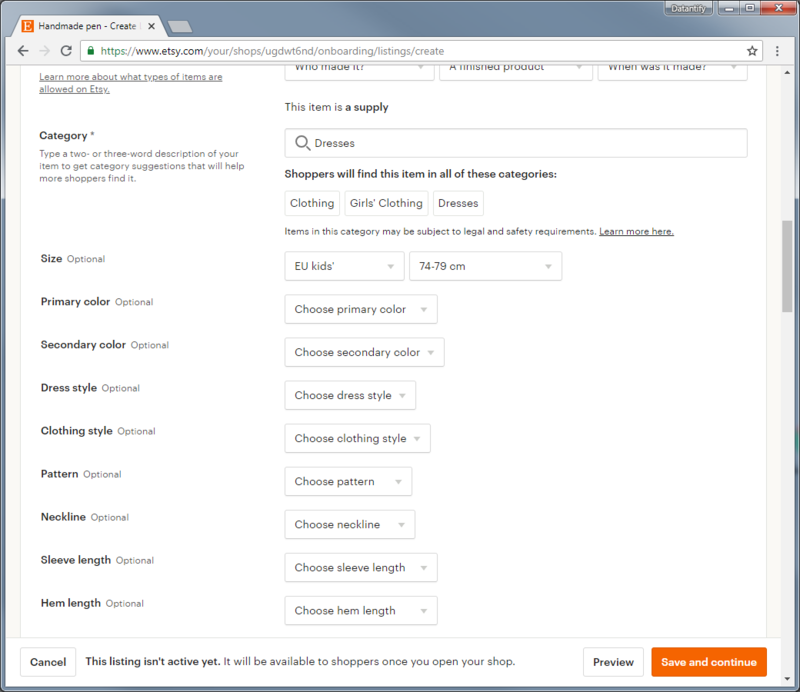 For example, once you choose the clothes category there will appear many new fields to select like a color, size, style and much more. It fully depends on what you are selling so you need to do it on your own. It is probably the point at which you should put the most effort into. You should be careful with the size which you enter and other really detailed information because the customer might be disappointed and return something back if you gave him the wrong details. So be really careful with that when you open a new Etsy shop. 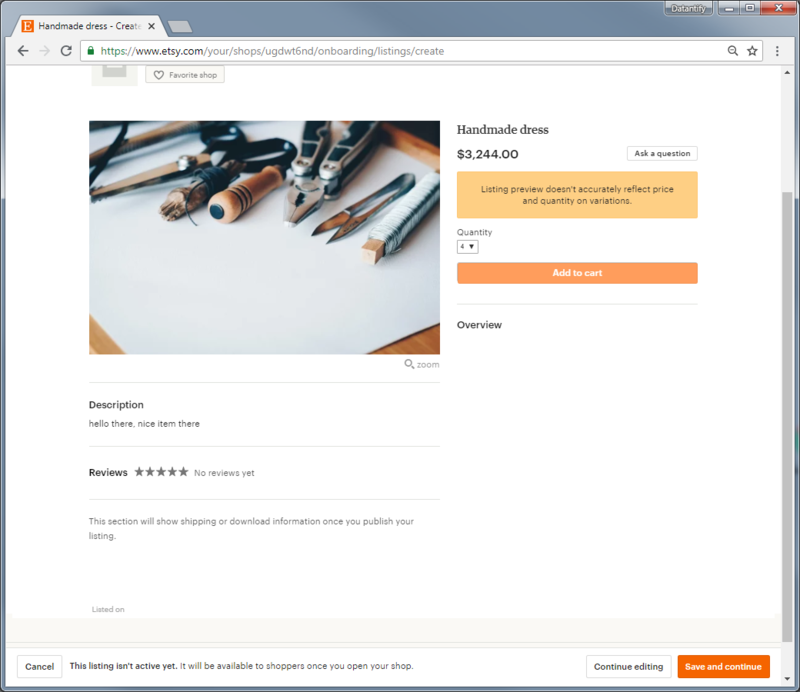 Etsy offers you a possibility to refresh your item listing when it expires for 0.20$ per each so it isn’t really a big cost. There is also an option to renew your listing on your own with the manual method and then it’s free but of course, takes more effort. Choose if your product is a physical or a digital product because Etsy allows people to sell non-physical items too. After the buyer purchases your digital product he will be able to download it from your shop. The most crucial point of your listing details. Thanks to the description of the item your newly opened Etsy shop might bring a lot of customers. If the description is interesting and informative more people will wonder if it’s not worth to buy your handmade goods. So remember always to not type something casual but interesting and unique because only thanks to it you will be more visible than other competitors. These are the most important and mandatory things which need to be set up to list your items. Of course, when you start Etsy shop you also need to set the prices for your items. 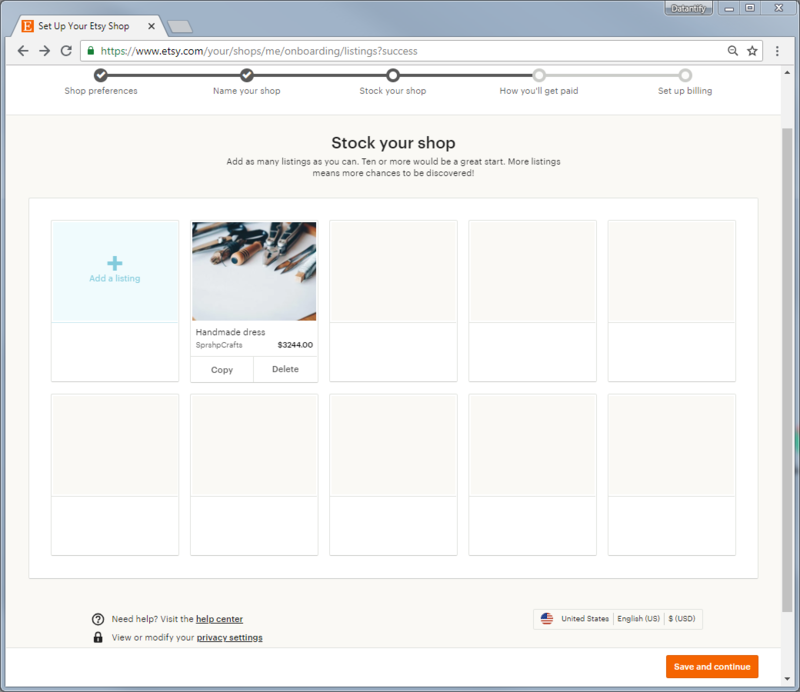 With Etsy, it is pretty simple. 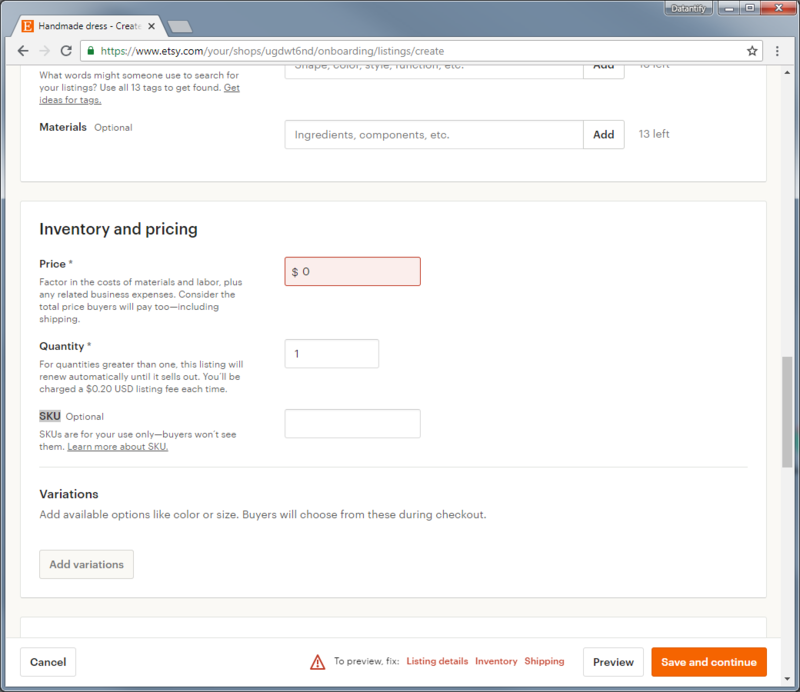 Just enter the price of your item and the quantity so the system will know when to stop the listing when you run out of your goods. Optionally there’s also a possibility to optionally enter SKU. As you know you can ship your items almost everywhere or country-wise everything depends on you. 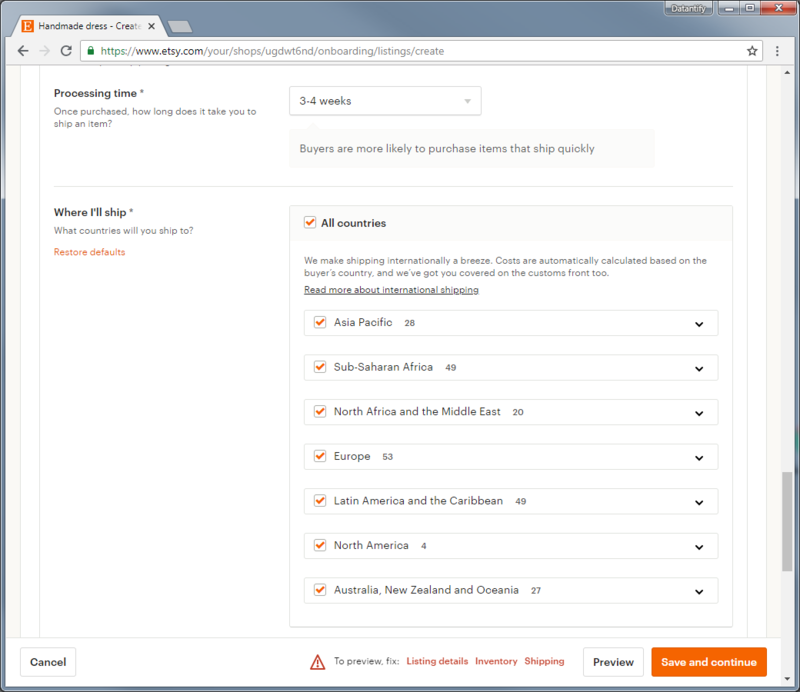 Etsy shop is making things much easier because they can automatically calculate for you the shipping cost for the specific countries. If you think they don’t calculate shipping cost correctly you can always set the fixed price. 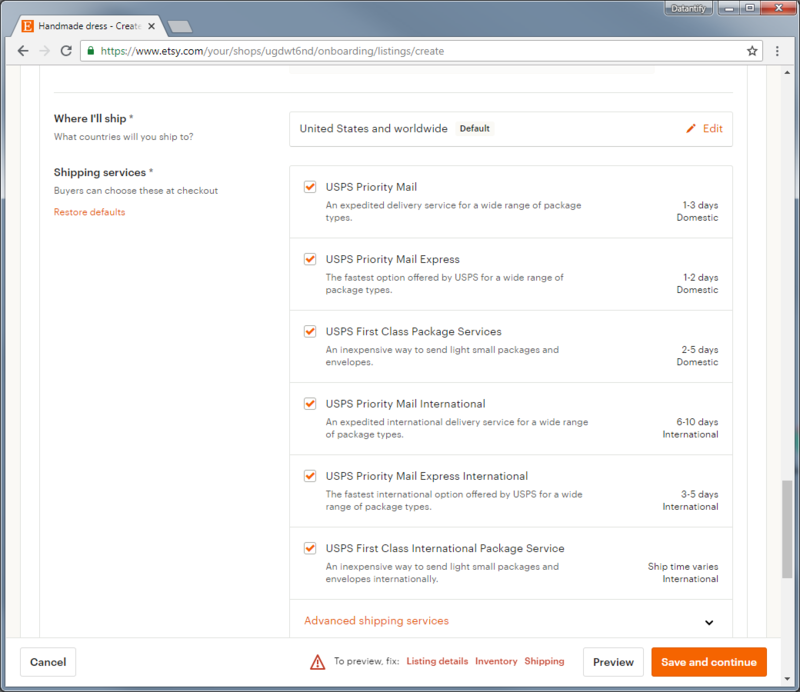 You also need to enter the zip code from which you ship the packages and how much time the shipping time might take. Except this, as it was mentioned earlier you can ship your goods worldwide or to a specific country and you can do it by choosing the countries in “Where I’ll ship” option. Then choose what shipping services will you to the customers of your new Etsy shop. There are a lot of them and we are sure you will find something for you which will also not disappoint your buyers. 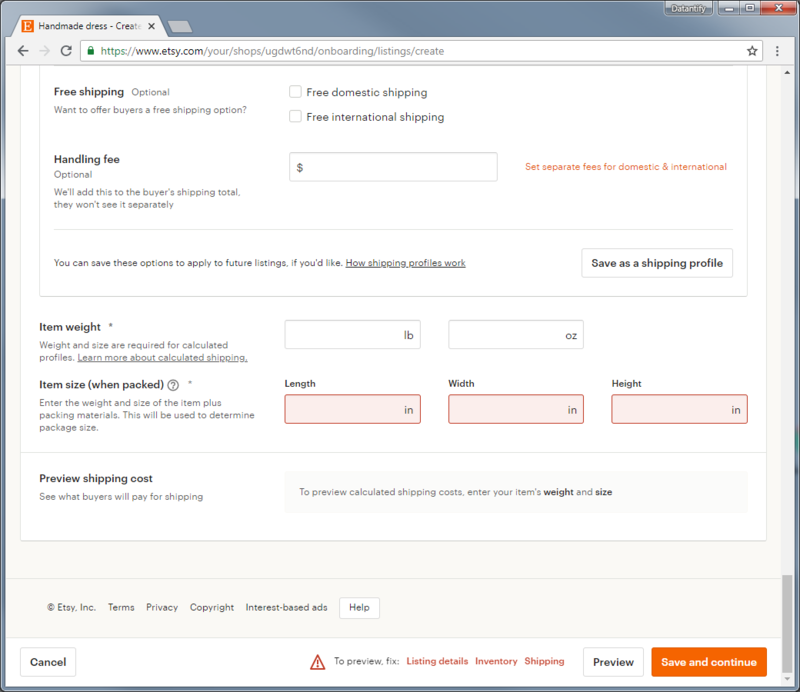 The last mandatory fields to fill are item weight and item size when it is already packed. Thanks to this it is much easier to count how much the shipping might cost. When you have entered all the information already now it’s time to check its preview. If you are satisfied with the preview and you don’t have to change anything just click the “save and continue button” to move to another step of creating. Of course, we entered only the example data to show you how it looks :). If you have more items to list you need to create a new listing and once again fill the entire big form to inform your customer about it. It might be exhausting and troublesome if you have like 10 various goods to sell but once you do everything you will be satisfied as never and wait for the money. All the fields in this tab are mandatory, but it isn’t strange. When it comes to the payments Etsy needs to be sure that you are a trustworthy and real person. 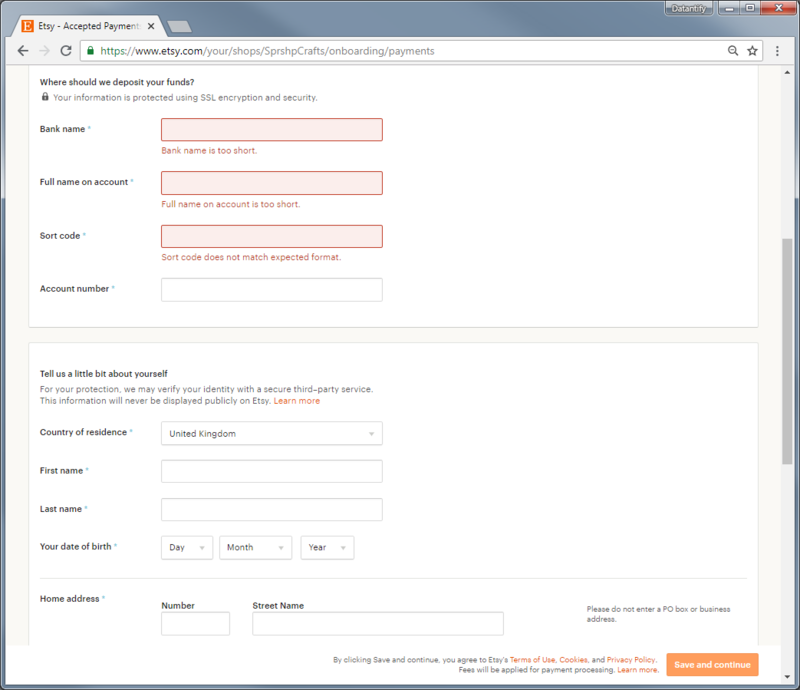 Once you’re done with the paid form the last step will be “set up billing”. Sadly we can’t go any further with you because we are not selling anything at the moment except our own B2B databases but the last step is only a continuation of the previous one so you should be fine. We have already ended the hardest parts of opening a new Etsy shop. At the end confirm all the information and now in “your shop” tab you have a possibility to see all your listings and to manage them and that is pretty intuitive so everyone can deal with it. If not you can always contact Etsy support and they will describe to you everything in a few minutes. Once you have successfully created your shop you can see your effects on your item listings. Everything you have done before now is displayed to your potential customers. That’s why as we mentioned it before it is so crucial to type a good description and choose an affordable price. Always remember to read reviews under your listings and see what people offer you to change or what they really like. If you they give you a good feedback you can improve. 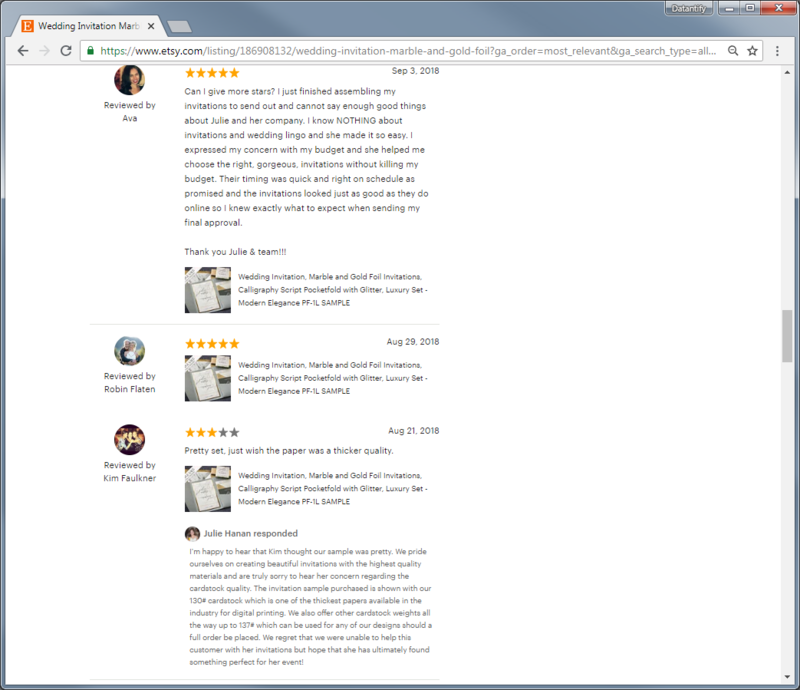 Even if the reviews are negative always try to answer the customers, because thanks to it they feel like you actually care about their opinion. Now, go check if someone didn’t buy or review your item! As you noticed making a new Etsy shop is simple and fast. The only thing on which you really need to spend time is listing and shipping details, especially if you have more than one item to list in your shop. Although it’s a little time-consuming the overall usage of the shop is great and if you are a person which loves to share the handmade good with others it will be a great opportunity for you to earn some money. If you would like to read more about the Etsy as a company and their fees you should check our comparison of best selling platforms in 2018. Now, thanks to our guide you already know how to create an Etsy shop and the last thing left for you is to prepare a good description of your products and competitive price so the customers can notice your items. Remember at first try to be visible and then eventually raise the price once you build a good brand for your store. If you think we missed any crucial point in creating an Etsy shop please let us know, your feedback is always valuable. Guide - How to find products to sell on Amazon?